This recollection of Mack Thornton Rogers made possible by his daughter, Ginger Collier. One of my most unforgettable characters in my long and storied newspaper career was a fellow by the name of Herb Gormley. I first met Herb Gormley when I was working at the Kileen Daily Herald (July 1984-August 1986) as a "cub reporter" fresh out of J-school. He was a 70-something semi-retired sportswriter who liked to come to the office a couple of times a week to shoot the breeze with the sports desk and whomever else hadn't heard his stories before. I enjoyed listening to his newspaper tales of long ago, and trying to imagine what reporting was like in the era before "portable phones" (what evolved into today's cell phones) and Cathode Ray Terminals on your desk. The most gripping story he told was the one that made a newsman out of him: On March 18, 1937, young Herb Gormley was a Western Union telegraph agent in East Texas, near a community called New London. Although it was in the midst of the Great Depression, the school district was the wealthiest in the nation, thanks to its location in the heart of the oil patch, where business was booming. The pride of the district was its state-of-the-art school, fueled by natural gas — which was odorless and colorless in those days. At 3:05 p.m. that day, when the school building was packed with hundreds of children, teachers and parents who were scheduled for conferences, a spark from a piece of shop equipment in the basement ignited an unnoticed gas buildup in the brick structure. Witnesses to the accident reported the building rose several feet into the air as the explosion began, and crashing into thousands of bits of rubble on the way down. More than 300 men, women and children were killed that day; some mangled remains never were identified. It remains the single largest disaster to strike a public school in our nation's history. It so shocked the world, even Adolph Hitler sent his condolences to the people of Texas. Men like Herb transmitted the horrifying news to the outside world, and within 15 minutes every fire truck, ambulance and hearse within 100 miles came to the scene, to try to rescue any survivors. Herb said he especially recalled seeing streets littered with white debris — the bread tossed out of factory trucks to convert them into instant ambulances. For several days, fueled only by coffee and cat naps, Herb helped reporters from around the country file their stories from the scene. A newsman was born. . . . When cancer finally got him, in 1986 I think, his was the first (and thus far only) Masonic funeral I have ever attended. I recall all the tall, stately men in their western suits, dress cowboy hats, and little white aprons and gloves. Every time they referred to "the Deity" they tipped their hats in respect. What a visual. The following year, when I worked for the Brazosport Facts, it was the 50th anniversary of the disaster and I tracked down two local survivors who lost their little sister, Sammi Jo, in the explosion. I still think of ol' Herb every once in a while. 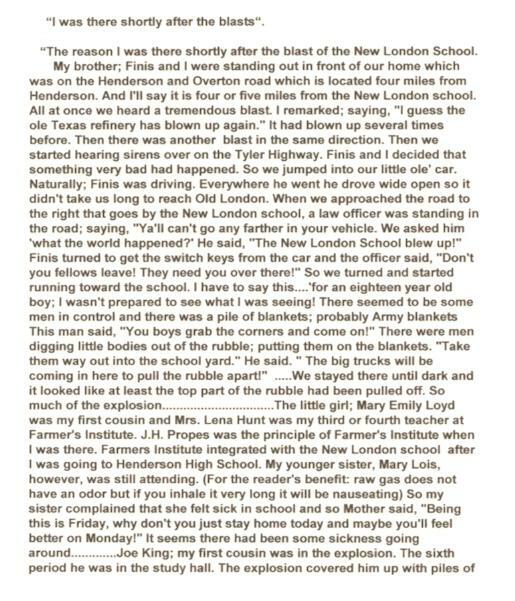 The school explosion happened before I was born. Nobody talked about it, until one day my Grandmother and I were looking at pictures and I saw a picture of Jack Nail. My Grandmother was the sister of Jack's Father. This is the story she told me. Robert Nail with his wife Ada and three children had just moved from Electra Texas to New London Texas. Jack was not happy about the move and leaving his friends. He was rebelling a lot. Robert bought him a pair of paratrooper boots he wanted, hoping it would help him adjust to the move. Jack was 14 years old so nobody knows why he was there. When Robert heard about the school he went over to help find the children. After a while he went to the building where they were putting the children's bodies. He saw one of Jack's boots under the edge of a white sheet. He walked over and put his hand on the boot, and Jack's leg fell off. They never found all of Jack's remains. My Grandmother said that between the day of the explosion ant the day of the funeral Roberta's hair turned totally white. She said it was like over night. He had the most beautiful white hair I had ever seen. Nobody would talk about it when Robert, Ada Buford or Bobbie were around. They did not say much when they were not around ether.